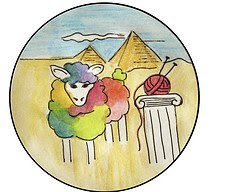 It is somewhat coincidental that I should be knitting “socks for a cause” for breast cancer during the same month I was scheduled for a mammogram. I chose this particular cause because my mom is a breast cancer survivor; fourteen years ago she underwent a mastectomy, radiation, and chemotherapy and is thankfully healthy today. You would think, considering her experience, that I would be diligent about having a yearly mammogram but I confess that I have been neglectful about making that all-important annual appointment. As I’ve been knitting these socks I’ve been reflecting on how vital it is that women do self-exams and get their yearly mammograms. After all, as the technician pointed out, the most common factor among breast cancer sufferers is that they are women. Genetics is secondary. So, if you haven’t yet, go book yourself a mammogram! This may be Vest-uary but this week has been all about the socks. 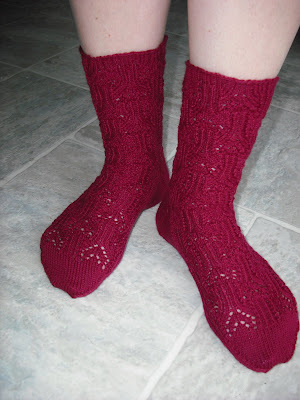 I immediately got hooked on my Annetrelac socks and once I got going I did not want to put them down. I also worked a bit on the Pink Ribbon socks and Mossinette. But in the back of my mind a little voice kept nagging me to finish my socks for January’s sockdown before I got too far into February’s and so I devoted the past couple of days to Queen of Cups and am happy to report that I now have a pair. And you didn’t think I’d neglect my vest entirely, did you? 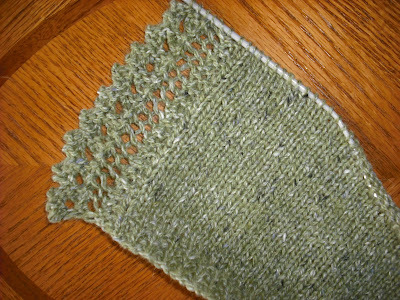 I have worked the first 4” and am now ready to begin the cable pattern at the waist. Unlike Christy, I don’t have a yarn fairy but I did have some Christmas money to spend on books and these two arrived on my doorstep yesterday afternoon. They are both winners and I can’t wait until I have some time to really dive into them. Maybe March? 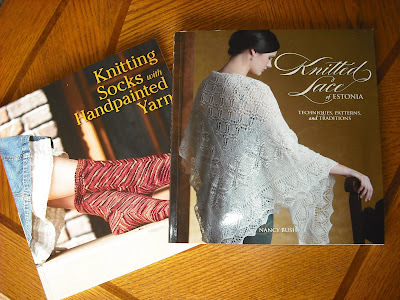 My mom, I mean my yarn fairy, bought that book, Knitting Socks with Handpainted Yarn and she didn't even get me one. 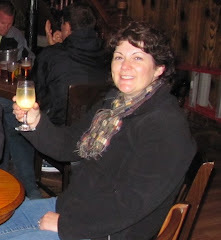 For which I am thankful because you know what my yarn tast is, semi-solid. Although, I do like the Longbourne socks in there. The queen of cups look beautiful and makes me want some Merlot. 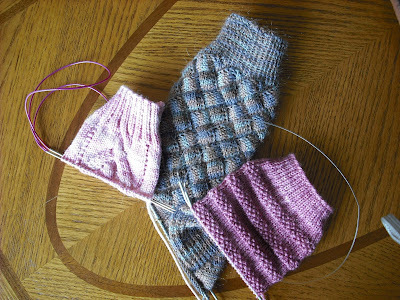 Believe it or not I now have five socks on the needles. One pair is to learn 2 at a time ML.